COBBLER: a traditional long drink that is characterized by a glass filled with crushed ice that is formed into a centered cone, topped by slices of fruit. 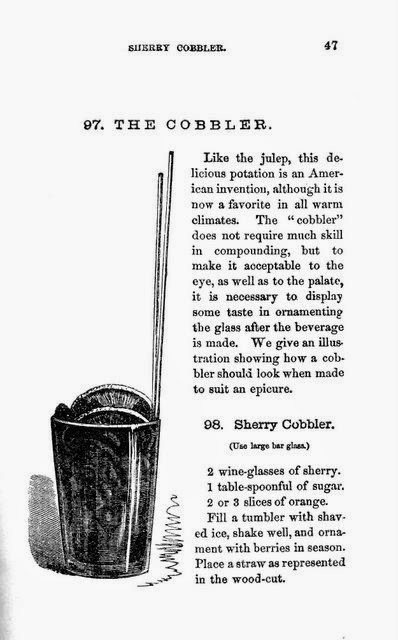 Dating back to the early 1800's, the Cobbler is a form of mixed drink that consists of a base spirit (originally some form of wine), sugar and fresh fruit. According to David Wondrich in Imbibe! Magazine, the Cobbler was very popular during the later part of that century. It's possible the use of crushed ice, a novelty in a mostly non-refrigerated world, and the newly invented paper straw contributed greatly to this popularity. Barkeeps would mound mountains of the crushed ice in a glass, top with fresh berries then add the necessary straw to get the cocktail past it all and into the mouth! For once I didn't mess with the recipe much as it is pretty darn good just the way it is. I used a homemade Berry Simple Syrup because I wanted to infuse to drink with more berry flavor and color. I also lowered the amount of sherry by 25 percent to keep in the spirit of a light cocktail and so I could have a couple of drinks. I like to enjoy my drinks on my deck while watching the sunset here in the Arizona desert and it takes a couple of cocktails to watch a whole sunset. DIRECTIONS: Gently muddle one orange slice with the simple syrup, about 1/2 cup of assorted berries and fruits (mine was 2 strawberries, 4 - 5 cherries and a few blueberries) in the bottom of a cocktail shaker. Add ice and the sherry and shake vigorously until your shaker frosts over. Strain into a highball glass filled with crushed ice packed in a mound. Garnish with more fresh berries and a tangelo slice. * If using a sweeter sherry, reduce the amount of simple syrup. The use of Sherry, which is a fortified wine originally from Spain, makes this a light cocktail, lower in alcohol content. While most spirits are 80 proof, sherry runs around 30 proof making it's alcohol content lower. 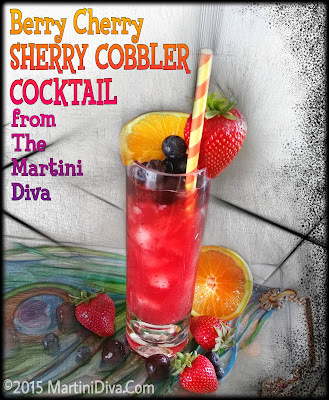 This makes a Sherry Cobbler ideal for hot days when heavy drinking just makes you sluggish and sleepy. ".... And it warmed my heart more than I can tell, yesterday, when I witnessed the spectacle of an Englishman ordering an American sherry cobbler of his own free will and accord - and not only that but with a great brain and a level head reminding the barkeeper not to forget the strawberries. With a common origin, a common language, a common literature, a common religion and–common drinks, what is longer needful to the cementing of the two nations together in a permanent bond of brotherhood?" ~ Mark Twain, Sketches New and Old, 1875.